One thing that I know about good, compelling blogging (because that’s the stuff that I like to read) is that you can’t be afraid to bare all and let readers inside of your head. Which entre nous, if I want to take this blog up a notch (and I do), might mean making us both a little uncomfortable from time to time. Like now, maybe. Sorry, but I gotta be me. 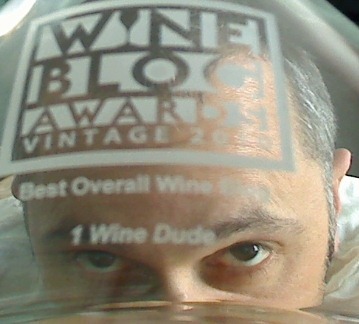 I’ve been thinking about the WBAs lately because the “trophy” just arrived in the mail – a very nice (and rather phallic) Riedel decanter with the WBA 2010 logo and the words “Best Overall Wine Blog – 1WineDude” etched indelibly onto the front (see inset pic and… jesus jumped-up christ, what’s with all of the gray hair on my head?!??). Anyway… the thing is, the Wine Blog Awards did kind of mess with my head. The part that really got me into the baking-your-noodle-to-a-crisp-golden-brown territory was trying to figuring out what the award meant, in the grand scheme of things. 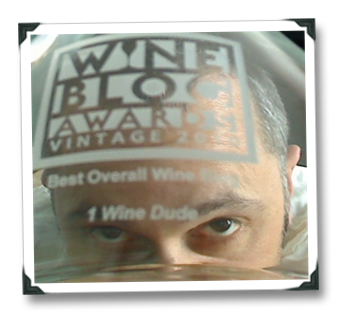 1WineDude.com has existed for about three years – a veritable eternity in blog-o-time, but where I come from that’s still more “promising rookie” territory than it is “top of your game” territory. The ironic thing is that in order to kick things up a notch and bring the blog up-to-snuff in my mind, things will not be more of the stuff that got us to whatever-the-heck-this-place-is where it is now. You will not see me “phoning it in” – I owe everyone reading this at least that much and probably a lot more. What’s become very clear to me since WBC10 is that a lot of people who are not necessarily 1WD readers sure have a lot of expectations about what this blog should or shouldn’t cover, should or shouldn’t include, should of shouldn’t be. Well-meaning or not, opinions on what I ought to be doing on these virtual pages have been coming out of the sediment-encrusted woodwork. If you’re one of those people carrying 1WD expectation baggage, consider this my advanced apology to you, because you are probably not going to be happy reading this blog in the future. Sorry, but I gotta be me. What those of you with an open mind (which I think is about 99% of you) will see are more risks being taken here, and hopefully more value being added. Some changes will be small (like a new-and-improved Search), others might be bigger (like a total blog redesign before the end of the year), and still others might be risky enough to make us both feel strange from time to time (like pushing the boundaries a bit on what should or shouldn’t be discussed in a wine context). Some things will stay the same, however – the future of 1WineDude.com will be continue to be very public – we will share in any successes AND in the spectacular failures together (but I will be the only one feeling actual pain if we crash into the fountain in front of Caesars Palace). This approach may not be the path to stratospheric website stats and bazillions of dollars of blogging income – but it will be genuine, hopefully will be fun, and certainly is the only way that I know how to do it from here. Anyway, I’m glad you’re along for the (baggage-free!) ride, because I wouldn’t be here without you – and I’d love to hear what YOU would like to see here in the future! First of all, you deserve the award! So enjoy the recognition in whatever context you choose…. Your's is the blog I most look forward to and I think part of it is that I know you are extremely knowledgeable, fair, and most importantly – real. I know that term ("real") can be overused, but I think it applies to you beautifully. You do say what is on your mind and I think you give your readers the benefit of reading through whatever is going through your mind. I think that is so compelling. Keep up the great work!! Thanks, Albert – you just made my day, brother! I hope I can live up to that! I'll second Albert's comments. You do deserve the award, so if you've got any kind of a guilt thing going, you might as well release it. I don't thing you've got to feel like you've got to notch your game up or change what you're doing. If knowing you've got all our support changes you in some way, then great. Since a wine blogger isn't going to get rich, at least you can bask in the praise! Joe, IMHO you're onto something. I made the same decision regarding my blog. In this age of transparency, readers wanna feel a connection with a real person, not some persoña camouflaged behind an image, like so many wine writers are. It's not easy revealing soul through the written word (especially online). It's a whole new art form. I think people can feel your soul coming through 1WineDude, even if they've never met you in person. Somebody once said good writing is easy, just slash your wrists and bleed all over the page. So continue to study wine, write well and push your blog to ever greater heights! Joe, my adopted journo-son, I predict that you will live long and prosper, but, like Spock, your ears will be pointy. Journalism, for that is what this is, has always succeeded best when the writer gives of himself and is himself. Trying to be something one is not will ultimately be seen for what it is–unreal. I suspect that your style is going to change over time, and that is also OK. Change is part of growth. Your audience is also going to grow in its understandings and needs. I am looking forward to all these your new directions and ideas. Your blog is uniquely yours, just as mine is what it is because it is mine. And the reason you won the award is because you were best for the times at the time. But time has a way of marching on, and we all need to learn new tricks, both young dogs and old dogs. 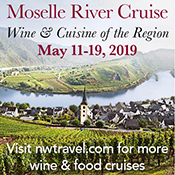 Hi, this is Finkus from Wine On The Rocks… and since this is my first comment on your site but not my first time here, I guess this officially makes me an ex lurker. I don't read many blogs to be honest, but I do drop in once in a while and like what you have to say and how you say it. Also liked the fact that you spent more than a buck and half to give your blog that personal touch. "I gotta be me", words to live by… look forward to seeing what your relaunch will bring and keep on keepin' ON! "Since a wine blogger isn't going to get rich…." – Yes, I also wonder. Can't we win the lottery? Joe, I love reading 1WineDude and look forward following your new you as well. As Albert said in the first comment; you're real! Joe, your blog is a standout blog. And there are hundreds of wine blogs – so if you're not yourself then you'll get lost in a sea of blandness. Although there aren't many good objective measures of wine blog success, the few there are suggest you've done extremely well. Thanks, Bruce – I appreciate it, especially given the work you've put in to understand all of those measures! Thanks, Kimberly – that's really the environment I'm shooting for here, so really glad to hear this! Man, you deserve it. The reason you won was because you are YOU. No expectations. No pressure. Just keep on, keeping on and those of us who know and love your writing will be here for you.